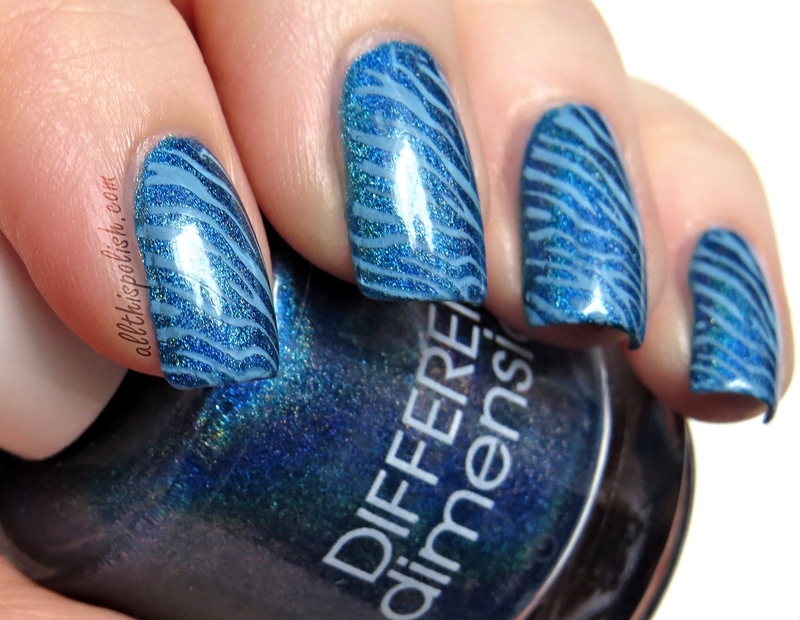 Here are a couple simple stamping manicures I did towards the end of January, using some gorgeous holos from DIFFERENTdimension. 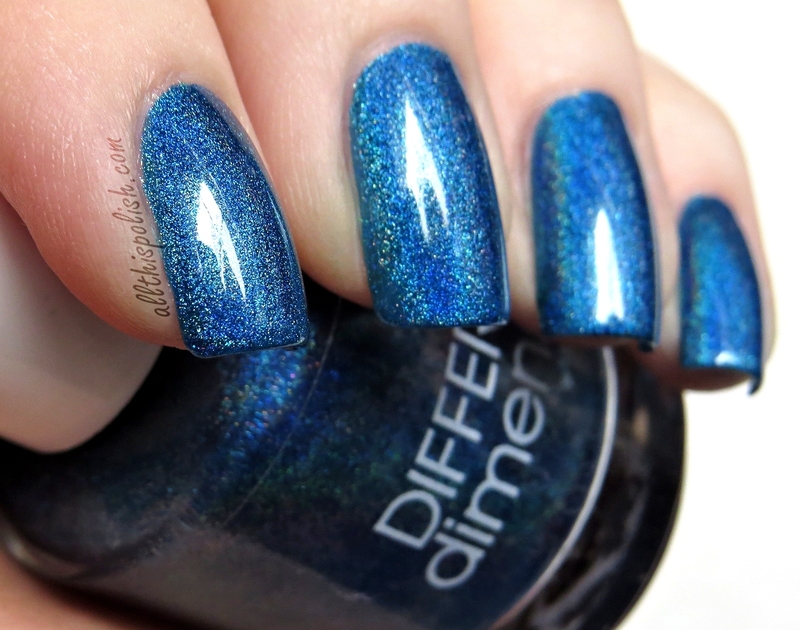 I bought these two polishes back in November and finally decided that they had been sitting in my untrieds for way too long. 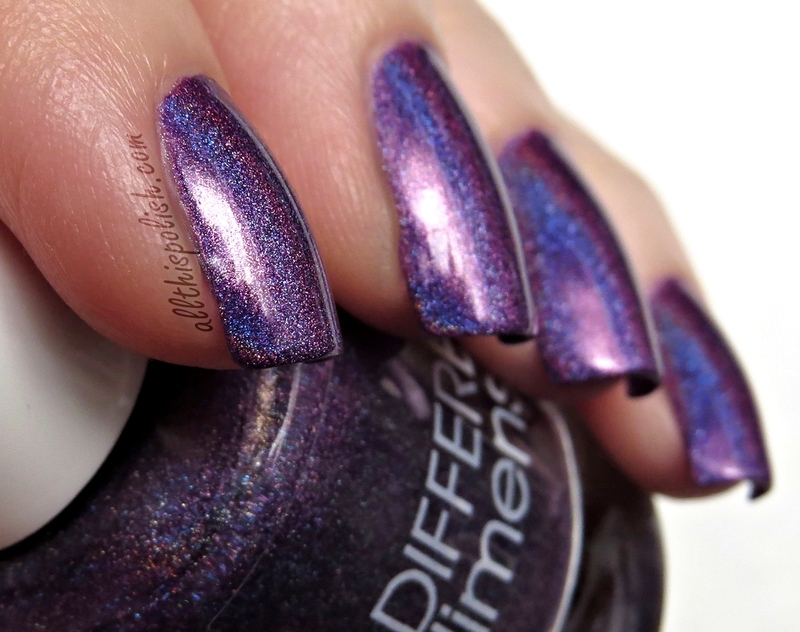 This might be a bit picture heavy, because I can't resist showing some swatches of these pre-stamping, so this seems like a good spot for a jump break. Let's start out with some shots of Just Keep Swimming. This is 3 thin coats and a coat of Seche Vite. Both of these holos, by the way, have great formulas. Smooth, easy application and I would say they were both opaque by the 2nd coat, I just have this polish-OCD issue where I always just seem to need that third coat of whatever polish I'm putting on. 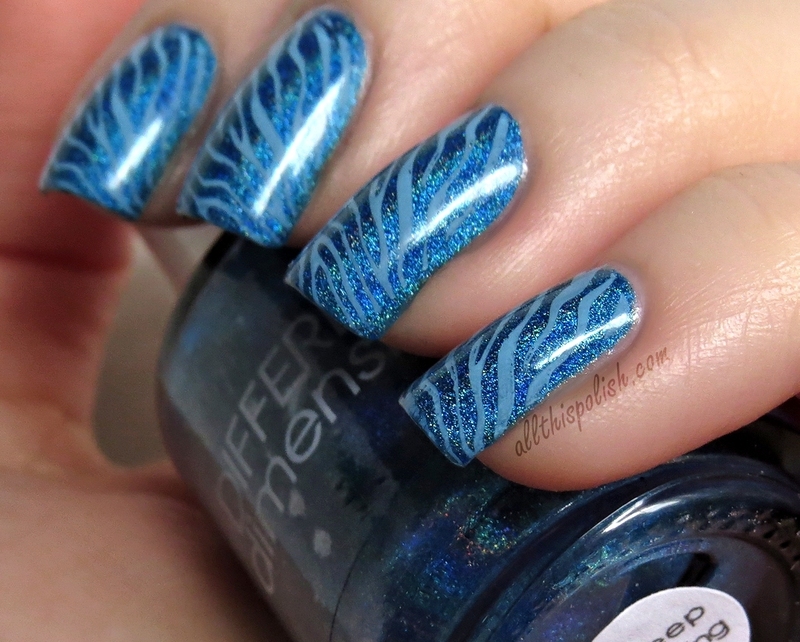 While I was wearing this, I had the urge to do some stamping. 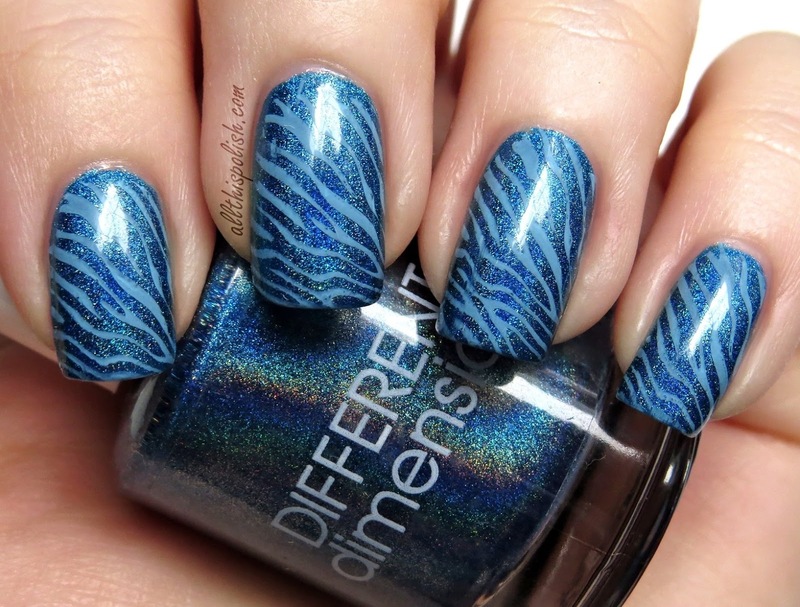 I had no idea what to do though, especially because stamping on holos gives me a mini complex. It's ridiculous, I know, but I can't help it nor explain it that well. 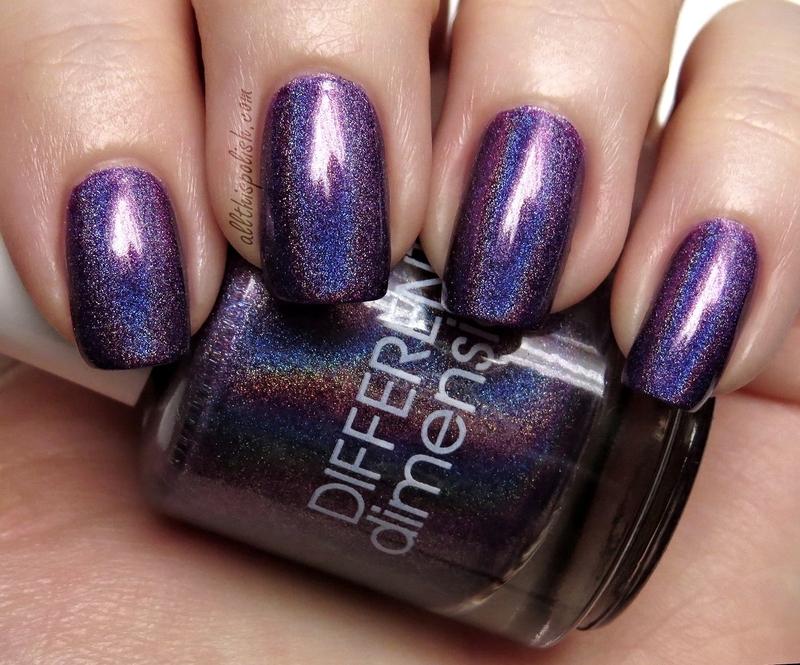 If I start with a holo base color, I just get it in my head that anything I try to put on it will just ruin it. Anyway, I got out my Bundle Monster binder and started flipping through the plates. For some reason, the tiger/zebra print pattern on plate BM-223 jumped out at me. And with the holo base, I thought the safest bet was to go monochrome so I stamped it using Konad Special Polish in pastel blue. Let me just say...I LOVED THESE! I was so surprised at how awesome such a simple stamp turned out. 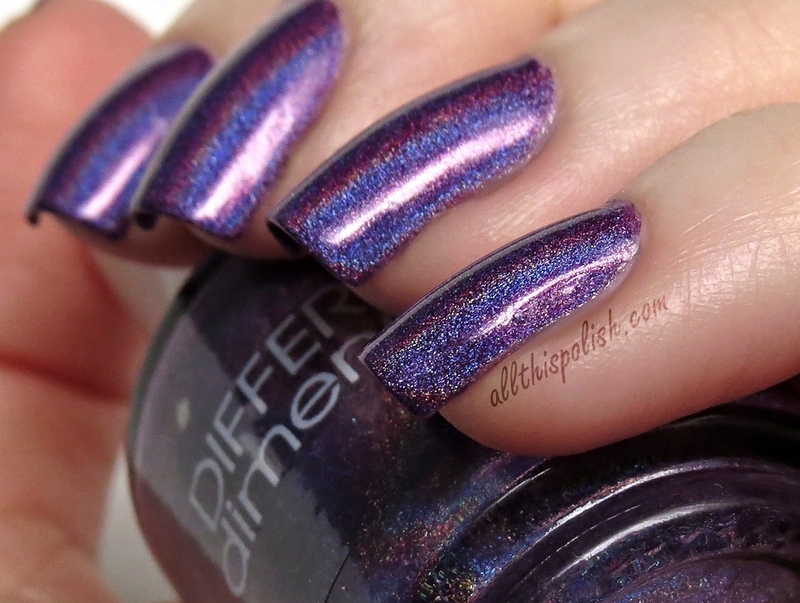 If I could get results like this every time I tried to stamp over holos, maybe I wouldn't be such a baby about trying it more often. My next immediate thought was that I had unintentionally just given myself Avatar nails, lol. I'm going to have to repeat this look again one day for sure. 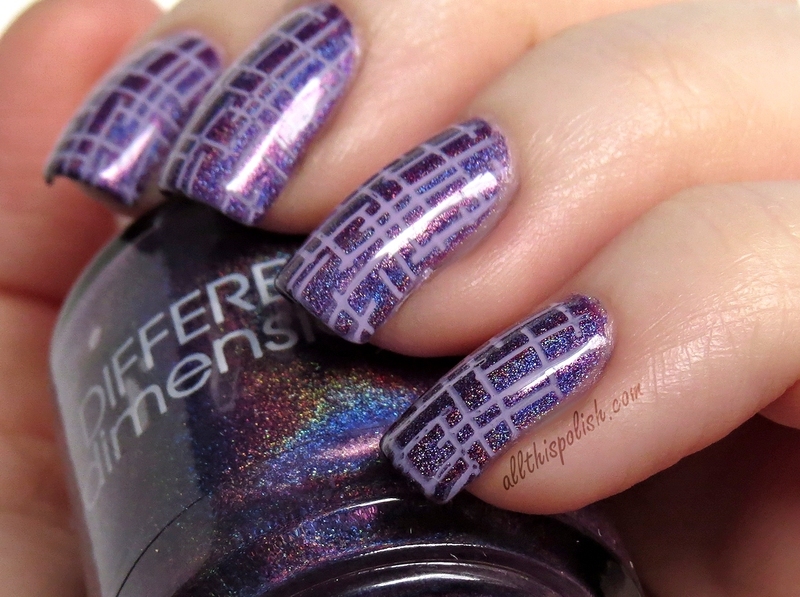 Next up, I wore Dueling Unicorns, an amazing purple holo. And again, 3 coats but 2 would have been enough. For this stamp, I picked out a design from Pueen plate PUEEN04. 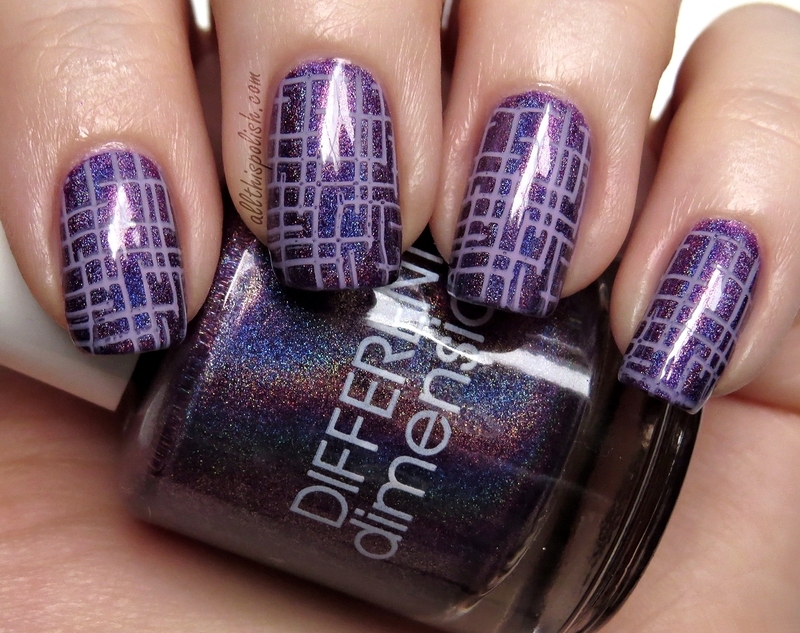 And I decided to go monochrome again and used Konad Stamping Polish in pastel violet. 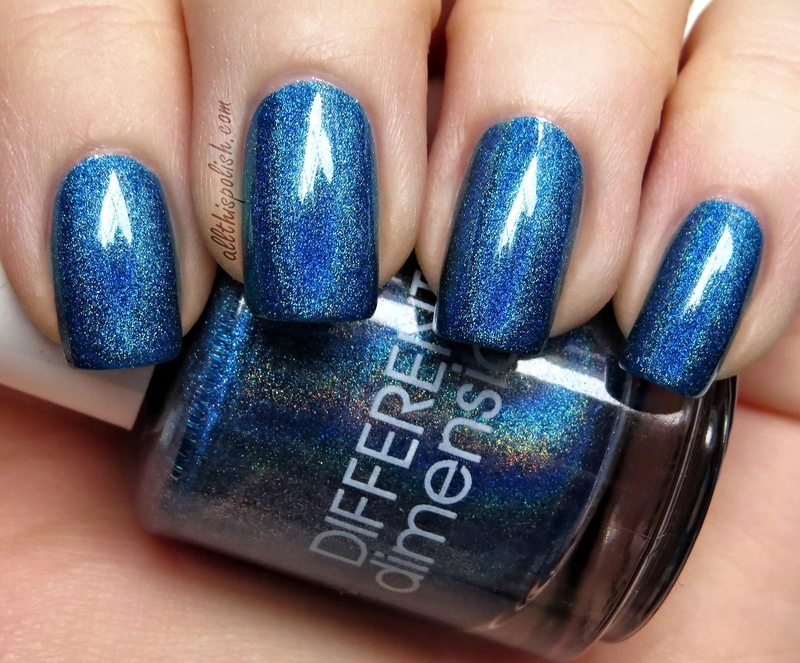 Definitely not as exciting as the blue nails, but I like the color combination. 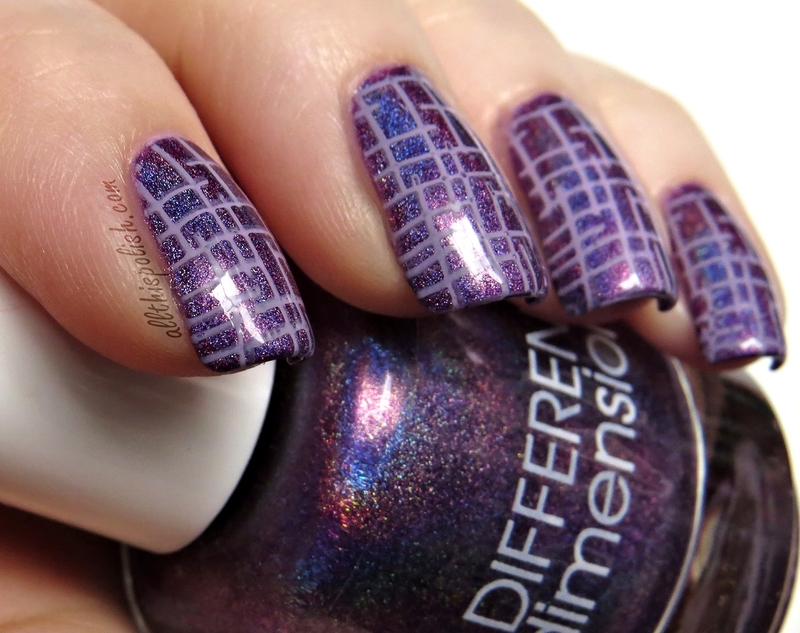 So I'll have to give these polishes another go together, but with a different stamp. 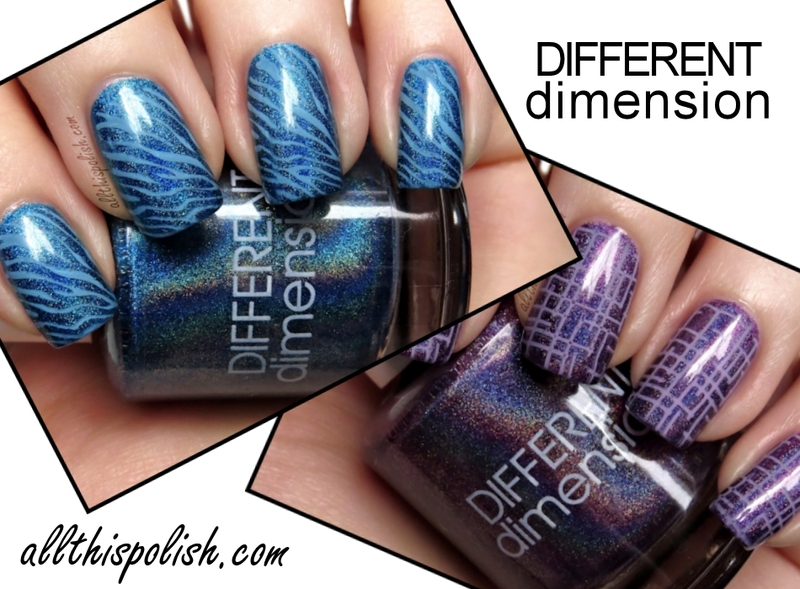 If you love holos, especially strong linear holos like I do, I definitely recommend the holos from DIFFERENTdimension. I've bought 5 different shades so far and I love them all.